Every time we watch football on TV, we see an example of technology that’s going to change the world sooner than we realize. That would be the yellow first-down line, which is an example of augmented reality. All that means is something is projected onto a real-life background that isn’t actually there. That’s what I was thinking about during the Super Bowl this past Sunday (because it was more exciting than watching three hours of punts). Even though this is a small example, it’s a technology that’s popping up all over the world. And it’s going to transform just about any industry that uses it. The augmented reality market has been hyped up for over a decade. Every year, it seems like it’s “the next big thing.” But so far it’s mostly been a disappointment. In 2012, there was lots of fanfare for Google Glass, the first “mainstream” augmented reality glasses product. Then in 2015, Microsoft’s HoloLens launched. And although the HoloLens has had some success, not much has materialized. Now, people are beginning to become skeptical on the industry in general. 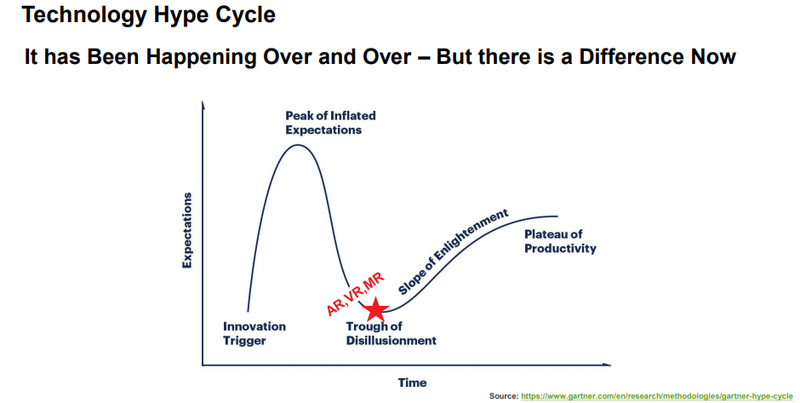 It is well-illustrated by the “hype cycle,” which has formed time and time again with all sorts of tech. When a brand-new piece of technology is launched, everyone wants to invest all their money into it. One timely example is bitcoin. The truth is, most things as different and transformative as augmented reality aren’t going to have an overnight impact on society. Although the stocks related to augmented reality have seen massive selling, the tech itself is making a lot more headway than people think. Typically, when someone thinks of an “augmented reality revolution,” they picture people walking down the street wearing some weird, ugly glasses and shopping online or playing video games. That’s not happening (yet). But we’re finding out that there are a lot more uses for augmented reality than we thought. For example, the biggest use for augmented reality so far is in the industrial field. Specifically, it’s being used often in construction and manufacturing. When you think of someone building a brick wall, it seems straightforward. It even seems like a robot could do it. And there’s actually a use for them for the most simple walls that need to be built. However, walls can also be extremely complex and contain complicated patterns and layers. And when these walls are done, they need to have a smooth, clean-looking exterior. Augmented reality has come up with a solution for making this process a lot easier. It starts with creating a 3D model of the wall that you want to build. Then, you can download that model to an app called Fologram, which is available on the Microsoft HoloLens. Through this app, construction crews can actually see the wall in virtual form right in front of them. The app tells them where to put the first set of bricks, and then analyzes each layer’s precise angles to adapt its instructions as the wall rises. Augmented reality has caught the attention of dozens of the world’s largest manufacturing companies. Boeing, GE, Lockheed Martin, Volvo, Siemens and Daikin are just some of the industrial titans using glasses like the HoloLens to improve the quality of their work. And it can also be a great help in the training process. For example, someone can now download an instruction manual onto an augmented reality headset. That allows them to see step-by-step instructions with images in front of them, showing them what to build. Clearly, this is a huge help in the training process. And like the brick wall example, these programs can let you see how anything should look and operate before you even build it. There’s also good reason to believe that this technology is going to impact our everyday lives over the next two to three years. Amazon, the king of consumer companies, has built augmented reality into its shopping app. This feature gives the user the ability to project an image of a product into their home to give them an idea of how it would look. So if you want to buy a piece of furniture, but aren’t sure if it would look good, augmented reality is there for you. Amazon is also working on a project called Virtual Dressing Room. This feature lets you project clothes from the app onto an image of yourself. Even Amazon’s Alexa has been programmed into a set of augmented reality glasses made by Vuzix. Facebook is another company that’s looking to make an impact in the field. In 2017, it announced that it was working on augmented reality glasses, but was still far away from selling them to the public. However, Facebook owns Oculus, a leading virtual reality company, which uses similar technology. Facebook also recently moved 400 employees to a new augmented reality division within the company. So, we may see this technology even sooner than anticipated. Right now, we’re seeing extremely high growth estimates for the augmented reality industry. Between this year and next year, 22.8 million augmented reality glasses are expected to be shipped out to people and companies all over the world. And by the end of next year, over 1 billion people will have personally used augmented reality technology at some point. But this is just a small part of the enormous growth we’re expected to see in the longer term. Last year, the augmented reality market was estimated to be worth about $5.91 billion. But by 2025, that number is expected to skyrocket to $198.17 billion, giving us growth of 65% per year, or 3,253% growth altogether. And 2018 was a step in the right direction, as the industry grew about 70%. Although there hasn’t been much public investment in this market recently, an exchange-traded fund (ETF) was launched to capture its growth last July. It’s called the Defiance Future Tech ETF (NYSE: AUGR), and it holds 68 stocks total. These stocks are in companies around the world. And each one is related to the surging augmented reality industry.